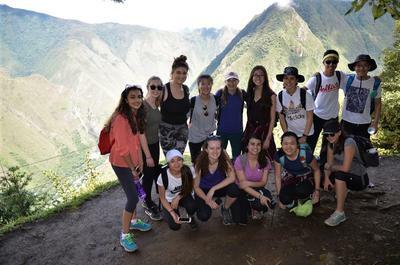 Over the 2017 March break, a group of 17 students from Ashbury College embarked on a thirteen-day adventure to Cusco, Peru. 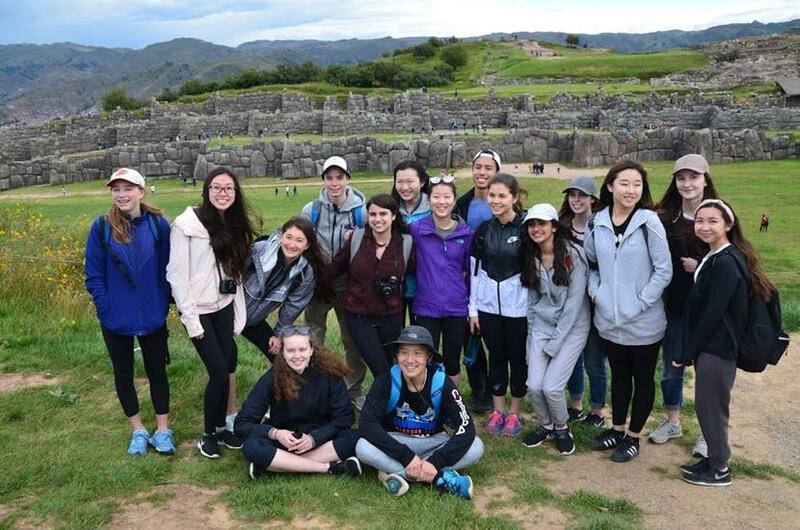 The two main objectives of our trip were to do service work and to participate in an archeology project while discovering Peruvian culture and learning some Spanish. 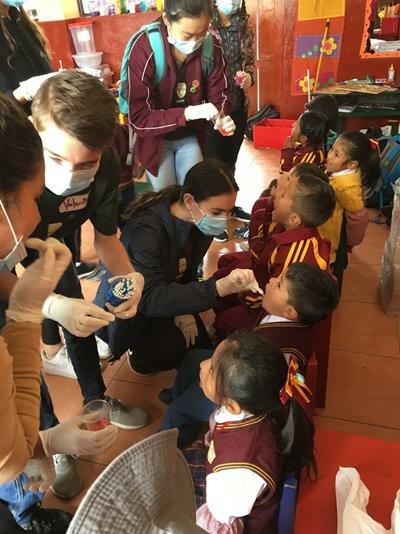 This trip presented the perfect opportunity for completing an International Baccalaureate CAS (Creativity, Activity, Service) project from start to finish. The volunteering component of the trip allowed for a service-based CAS project. Our preparation for the trip began two to three weeks before our departure. We had a collective group meeting in which we established that we would be taking supplies such as books, toys, and school supplies to the schools we would be volunteering at. Each group member contributed a small monetary donation to cover the cost of the toys and supplies. We also ran a book drive at our school in the two weeks leading up to our trip. We placed a collection box at the front of the school in which anyone could contribute a book donation. All the collected resources were placed in an additional suitcase which we took with us to Peru. Upon our arrival to Peru, I think everyone enjoyed the warm weather we had been missing for months. On our drive to the hotel, we were amazed at the different architecture and structure of the town. Our first meal was quite memorable because we got to interact with people in Spanish, we tried new dishes, and listened to live traditional music. While most of us were feeling a little out of it due to the altitude sickness, we quickly adjusted over the next couple of days and were ready for our new adventure. The best part was that everyone got to bond and get to know each other really well, which helped us be a very strong and supportive group. Having such strong group bonds truly helped enrich the whole experience. 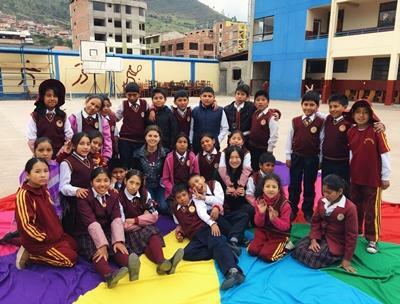 We spent four hours every day at the Bolivariano public school in Cusco where we worked with two classes of grade five students. For the first four days, our main focus was teaching the kids basic English literacy and numeracy skills. Every day we would use visual cards to teach the kids basic words in English such as foods, animals, and body parts. We would then play interactive games – for example, we would show an image and ask the kids to name the item in English. We also had math games in which the kids would work in teams to solve different puzzles. At the end of the day, we would go outside with the kids and play games while reviewing what we taught that day. On our last day at the school we ran a dental campaign where we administered a fluoride treatment to all students at the school. Each of us was responsible for applying a fluoride gel with a Q-tip on the teeth of the kids. This was very different from what we had done in the previous days because we got the chance to interact with students of all ages. I was so impressed and touched by how kind and warm the students, parents, and teachers were. The kids were eager to learn every day and always greeted us with a huge smile on their face. I was particularly touched by the generosity of the kids and parents who offered us food every day. On our last day, the kids gave us gifts to thank us for our work. To this day, I continue to be amazed at how well we were received and what a great impact a small act can have. I was left breathless on the bus ride as we were going higher and higher toward Machu Picchu. Seeing the fog rise through the lush vegetation, I instantly fell in love. This was of course not even comparable to the actual site. From the very first moment I saw Machu Picchu, I felt as though every moment was a surreal experience. I was amazed by the intricate architecture of this site and by the fact that it looks intact after hundreds of years. As we toured Machu Picchu, my group could not stop remarking how the majestic landscape looked like something from a movie rather than real life. Machu Picchu certainly left a lasting impression and left me wishing to return as soon as possible. Leaving was very hard for me, probably much harder than I had anticipated. On my last day of volunteering, I had great difficulty leaving behind all the kids I had formed such strong bonds with over the past week. It was especially hard seeing how sad the kids were when I told them I would not be returning next week. Even three months after the trip, I still miss the people, the places, and the food. At the same time, I am so happy with the course of the trip. Not only did I accomplish my goal for completing my CAS project, but I accomplished so much more. I met and interacted with new people and learned about a new culture. I stepped out of my comfort zone and spoke Spanish and hiked on the mountainside at Machu Picchu. I tried new foods and saw new places. Every day spend in Peru bears a special memory for me. I cannot wait to come back to Peru as soon as possible. If I could do anything differently, I would stay longer and visit more cities. Finally, I would definitely recommend Projects Abroad. I was impressed with the level of organization and true passion. I strongly believe that the trip would not have been as successful without the constant guidance of Projects Abroad. How has this experienced changed you and what is your ‘take away’? "I had many ‘take aways’ from this trip. One that stood out was my amazing appreciation of the Incan culture." "This experience has undoubtedly changed me in the sense of how I appreciate and look at the world around me each day. I have a much deeper gratitude of modern amenities and seeing how happy the kids and the entire society was with little resources changed my perspective." 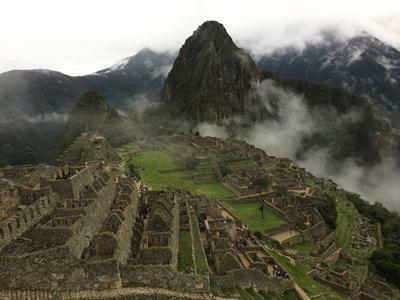 "From this trip, I could immerse myself in a new culture and In doing so, adapt to cultural difference and learn more about Peruvian traditions." To what degree did you meet your goals? "I am very happy to say I met all my goals through experiencing Peruvian culture and interacting closely with the kindergarten children. My peers supported me throughout the trip and I supported them as well. " "I think I certainly met and possibly even surpassed my goals. I discovered a new country and its culture by visiting many archaeological sites, learning about Incan culture and touring the city of Cusco. Going to the markets, watching traditional dances, trying delicious food and interacting with the local people gave me a small glimpse into Peruvian culture. I truly challenged myself to develop my Spanish speaking skills in my work with the grade fives. Physically I felt challenged by the altitude and hiking on open mountain paths at Machu Picchu certainly got my heart racing! Most of all I tried to make the most of this unforgettable trip by keeping an open mind and engaging myself fully in all activities from sampling guinea pig and ceviche and taking loads of photographs." "Don’t feel shy or awkward, just jump in and you will be surprised at the result." "Service is only worthwhile if it is really meaningful to both the giver and the receiver and when, at the end of the day, both can walk away with a positive ‘take away’"
"Ever once and a while try to simply stop, realize where you are, how lucky you are and take it all in. Those are the moments you’re going to remember." "No matter where you travel in this world you can always give your time to others. You can learn so much from giving service to people who are very different to yourself. Whatever you invest your time in, your little action can go a long way."